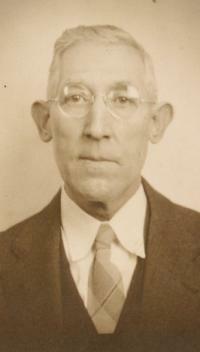 Bradley Thomas Johnson, son of Zachariah & Missouri (Woodburn) Johnson, was known to me as "Granddaddy General." He was born in March of 1883 and died in 1954. I have been told he was named for General Bradley Thomas Johnson who attempted to free the Confederate Prisoners at Pt. Lookout Maryland. (Guess we know whose side my relatives sided with). He was born in St. Mary's County but moved to Baltimore so he could pursue his career as a machinist. From him my father got his mechanical ability. Sadly it didn't carry down two generations. He worked initially at a sawmill in St. Mary's County and then for the Southern Railroad as a machinest in Delray, Virginia. This must be where he met Mary. He then worked at a "snap button" factory on Monroe St. in Baltimore, MD. Eventually he moved his family to Relay, Maryland and rented the house in the picture at bottom left. I remember seeing him only briefly before he died. He was in a tuberculosis sanatorium* near Sabillasville, MD which is near Frederick, Maryland. The center was up in the mountains. My last memory of him was waving goodbye to him as he stood on the porch of the sanatorium. Later, when he became ill he was transported to Hagerstown Hospital where he died. My Dad was the only one who made it there in time to see him before he died. He married Mary Gertrude Fagan but he called her "Nancy." She is pictured here. She was from Virginia and was a true Southern Belle, schooled in embroidery. She took a daily afternoon nap. Her father was apparently in insurance. She died in Baltimore. According to her son Bradley Johnson, Jr. She loved chocolate and hats. She would buy a new hat every Spring. She had a brother Patrick, a sister Sally Fagan Parsons and a sister Jane Fagan. She died in 1964. 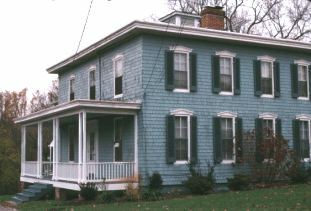 Bradley and Nancy lived in this home in Relay, Maryland. I always remember that it had a covered stairway in the back which I loved to play on because it was like a secret tunnel. This house is just down the street from the apartment building where I was born. I took this picture in 2000 when my Mom and I took a trip back to the old neighborhood. Thanks to Kathy J. Hall, a gracious volunteer who did the lookup work for me, we now know that Bradley and Mary are buried in St. Mary's Roman Catholic Cemetery. This historic cemetery is located in the Olde Town section of Alexandria, Virginia. Bradley was buried on December 11, 1954 and Mary Gertrude was buried on January 22, 1964. George Washington was a subscriber to the building. 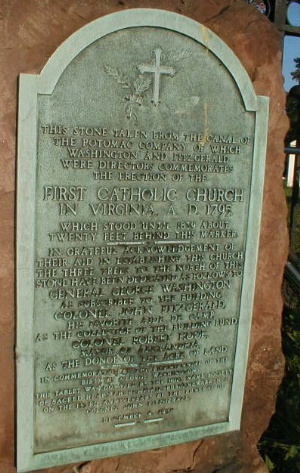 St. Mary's was the first Catholic Church in VA, built 1795 and stood until 1839. The cemetery remains in the Olde Town area but there is a new church elsewhere. Center origins date to 1908 when the State Sanatorium for tuberculosis patients was established on the site. Placed under the Department of Health in 1949, the Sanatorium was renamed Victor Cullen State Hospital after Victor F. Cullen, M.D., a former member of the State Board of Health.